Home Technology Facebook Down: FB App Users Unable To Login; Problem NOT Solved! 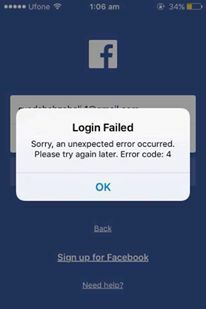 Facebook Down: FB App Users Unable To Login; Problem NOT Solved! Facebook Down FB App Login: The biggest social-networking platform once again faced problems. The app users are not able to login. It seems that their login servers have gone down. FB is a social network where the member shares messages and status updates with online friends. The system also offers a platform for third-party developers. Facebook is having issues since 7:45 PM IST. Are you also affected? Leave a message in the comments. UPDATE: The problem is rectified and the app is working fine now. Update your Facebook app to the latest version whether you are using iPhone or Android. From Android mobile phone you can try going to Settings- Application- FB and clear all the cache data before logging in. It might be a temporary problem and has been observed by some users from different locations. I cn’t log in my fb accnt. I have not been able to log in since feb. Before that I would try and change my phone number and it wouldnt allow me to change it. I have submitted my identifaction. Stil nothing. Has been fixed. When I try and log in and find my account. It takes me to someone’s else’s account. I use the mobile web version (better UI, experience) and it’s still down. I changed my email address from michaelsavoie716 @ yahoo.com, msavoie716 @ yahoo.com the password is Callan5597 or Callan7015597. I’ve sent 3 copies of my drivers license and you keep asking for my old email address which has been deleted. I do not know what more you need from me but you have all my personal information with the exception of my blood type, urine screen and social security number. When can I expect your problem with my account to be resolved? This is ABSOULTELY ridiculous and if need be I will have some anonymous friends get me back into my account . My comment is waiting a f***ng reply?? I’ve already been without FB for a day and a half now.